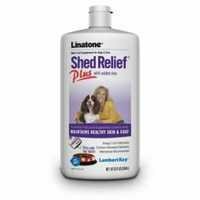 Lambert Kay Linatone Shed Relief Dog and Cat Skin and Coat Liquid Supplement, 32 Ounces helps reduce excess shedding by providing essential fatty acids and nutrients that are potentially lacking in the diet. This daily skin and coat supplement for dogs and cats is made with Omega 3 and 6 fatty acids that are essential for a healthy, shiny coat and hair and to reduce excessive shedding. Mix with food or feed directly daily. If dog or cat is fed twice a day, divide the serving between feedings and mix with food. Give adult dogs 1 teaspoon per 20 pounds of body weight. Give puppies 1 teaspoon per 10 pounds of body weight. Give pregnant or nursing females 1 teaspoon per 10 pounds of body weight. Give cats and kittens 1/4 teaspoon per 2 pounds of body weight. Double daily serving for first 5 days if skin is very dry. Proudly Made In the USA. 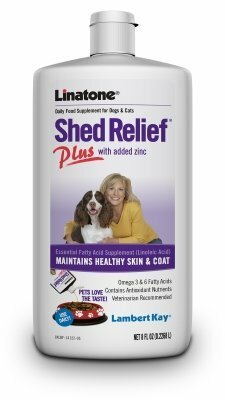 Lambert Kay Linatone Shed Relief Cat Skin and Coat Liquid Supplement, 16 Ounces helps reduce excess shedding by providing essential fatty acids and nutrients that are potentially lacking in the diet. This daily skin and coat supplement for cats is made with Omega 3 and 6 fatty acids that are essential for healthy, shiny hair and to reduce excessive shedding. Mix with food or feed directly daily. If cat is fed twice a day, divide the portion between feedings and mix with food. Give cats and kittens 1/4 teaspoon per 2 pounds of body weight. Double daily serving for first 5 days if skin is very dry. Proudly Made In the USA. 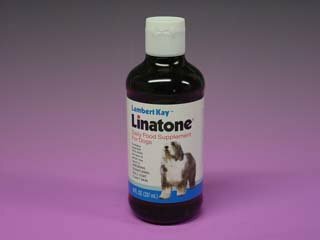 11106 LINATONE SUP/DOGS 8OZ LINATONE for Dogs8 fl. Oz.Contains essential fatty acids, the lack of which may result in dull coat, shedding, scratching, and flaky skin. Pets love the taste. Add it to the food or give directly. Contains essential fatty acids, the lack of which may result in dull coat, shedding, scratching, and flaky skin. Pets love the taste. Add it to the food or give directly. PBI GORDON CORPORATION - LAMBERT KAY LINATONE PLUS SUPPLEMENT (8 OZ) "Ctg: DOG PRODUCTS - DOG HEALTH - VITAMINS & SUPP"
This dietary supplement for dogs and cats, with zinc and proteins, is formulated to improve pet's skin and coat. The absence of fatty acids in the diet may result in dull coats and itchy, flaky skin. Linatone Plus is formulated to give dogs and cats linoleic acid that their bodies cannot absorb from commercial food. The formula also promotes a healthy coat and normal skin. It contains essential fatty acids and vitamins A, D and E. Also contains zinc and protein to help prevent shedding and maintain vibrant coats. Helps revitalize healthy skin and coat for dogs and cats. Veterinarian recommended. Contains soybean oil, glyceryl oleate, water, hydrolized milk protein, lecithin, zinc sulfate, vitamin E, methylparaban, annatto, vitamin a palmitate, propylparaben, anise oil, vitamin D3, dimethicone. Dosage: Dogs- 1 teaspoon per 20-pound of body weight. Puppies- 1 teaspoon per 20-pound. Cats- 1/4 teaspoon per 2-pound. Measures 12-inch length by 6-inch height by 6-inch width. 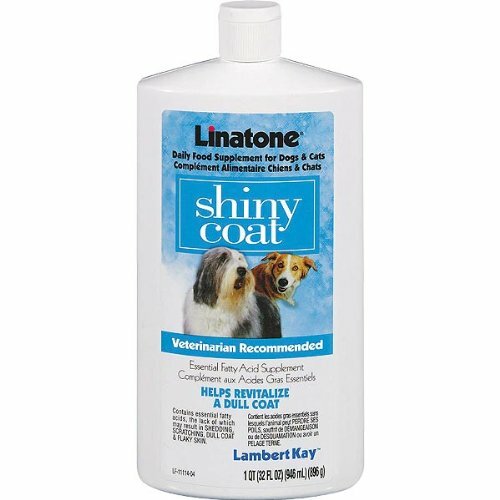 This dietary supplement for dogs and cats, with zinc and proteins, is formulated to improve pet's skin and coat. The absence of fatty acids in the diet may result in dull coats and itchy, flaky skin. Linatone Plus is formulated to give dogs and cats linoleic acid that their bodies cannot absorb from commercial food. The formula also promotes a healthy coat and normal skin. It contains essential fatty acids and vitamins A, D and E. Also contains zinc and protein to help prevent shedding and maintain vibrant coats. Helps revitalize healthy skin and coat for dogs and cats. Veterinarian recommended. Contains soybean oil, glyceryl oleate, water, hydrolized milk protein, lecithin, zinc sulfate, vitamin E, methylparaban, annatto, vitamin a palmitate, propylparaben, anise oil, vitamin D3, dimethicone. Dosage: Dogs- 1 teaspoon per 20-pound of body weight. Puppies- 1 teaspoon per 20-pound. Cats- 1/4 teaspoon per 2-pound. Measures 8-inch length by 1-4/5-inch height by 3-1/2-inch width. 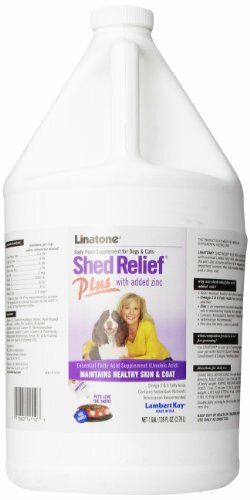 Lambert Kay Linatone Shed Relief Plus Dog and Cat Skin and Coat Liquid Supplement, 8 Ounces helps reduce excess shedding by providing essential fatty acids, protein, zinc and nutrients that are potentially lacking in the diet. This daily skin and coat supplement for dogs and cats is made with Omega 3 and 6 fatty acids, protein and zinc that are essential for a healthy, shiny coat and hair and to reduce excessive shedding. Mix with food or feed directly daily. If dog or cat is fed twice a day, divide the serving between feedings and mix with food. Give adult dogs 1 teaspoon per 20 pounds of body weight. Give puppies 1 teaspoon per 10 pounds of body weight. Give pregnant or nursing females 1 teaspoon per 10 pounds of body weight. Give cats and kittens 1/4 teaspoon per 2 pounds of body weight. Double daily serving for first 5 days if skin is very dry. Proudly Made In the USA.